The cottage cheese diet is a short crash diet meant to cause fast weight loss. As it is the case with most fad diets, it provides little nutrition and is very low in calories. According to Health.com, crash diets are not only dangerous, but they can also slow down your metabolism and lead to weight gain in the long run. If you plan on trying the cottage cheese diet, check with your doctor first, especially if you have a medical condition or are taking prescription medication. There are several versions of the cottage cheese diet. Some are for three days, some are for seven days. While cottage cheese is the base of all versions of the diet, the other foods you can eat along with it also vary. Some versions of the diet allow you to add cinnamon or Splenda to the cheese. Other versions of the diet allow you to eat either fruits or vegetables along with the cottage cheese. The amount of cottage cheese you're supposed to eat also varies, with some versions of the diet saying you can eat as much low-fat cottage cheese as you want and others saying you must stick to 100 g or 3.5 oz. The obvious benefit of the cottage cheese diet is that it works. Because you'll be cutting down calories drastically, it's easy to lose weight. The cottage cheese diet doesn't allow for any grains and only one or two servings of fruits during the day, so your carbohydrate intake will be very low. Low-carb diets work over the short term because they cause water loss, according to Weight Loss Resources. There's no need to count calories or follow complicated menu plans with this diet, so it's an easy solution if you want to lose weight quickly for a special occasion. Low-calorie diets such as the cottage cheese diet can cause fatigue, nausea and an overall feeling of weakness, according to the National Institute of Diabetes and Digestive and Kidney Diseases. If you continue the diet for a long period of time, it can lead to loss of muscle tissue, which in turn can cause your metabolism to slow down. Crash diets such as the cottage cheese diet can also affect your immune system and leave you more susceptible to illness. If you want to follow the cottage cheese diet to jump-start weight loss, use one of the short versions of the diet, rather than being on it for seven days. 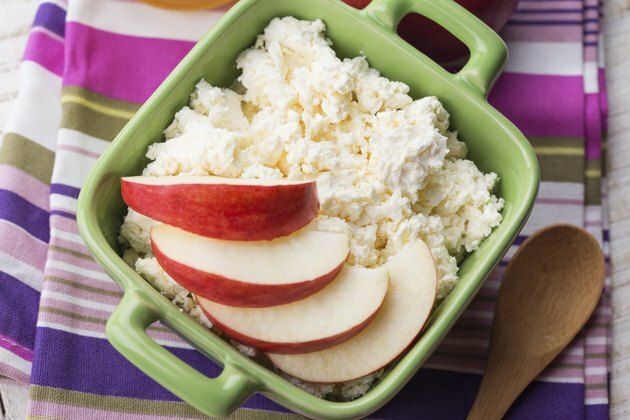 Don't eat only cottage cheese, but instead add fruits and vegetables to each meal, so you're getting more nutrients. Eat at least three meals a day. Since some versions of the cottage cheese diet allow two snacks a day, take advantage of that, as well. This will keep your calorie intake a bit higher and prevent muscle loss and other side effects. Weight Loss Resources: How Do Low Carb Diets Work?